Teaching Assistants (TA’s) and Technical Writing Assistants (TWA’s) not only provide important support for students and staff in the teaching laboratory and on field trips, but they gain valuable teaching experience. 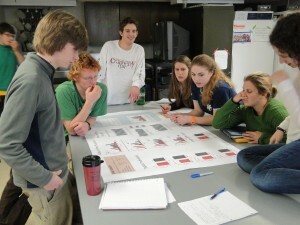 Andy Wood ’11, (ctr) TA for Bio 270 (Ecology and Evolution), facilitates as students discuss the results of their white pine demographics study at Range Ponds State Park. The Biology Department at Bates College employs undergraduate Teaching Assistants (TA’s) and Technical Writing Assistants (TWA’s) in the core level and some upper level courses to assist the teaching staff (professors and AI’s) in the course laboratories. 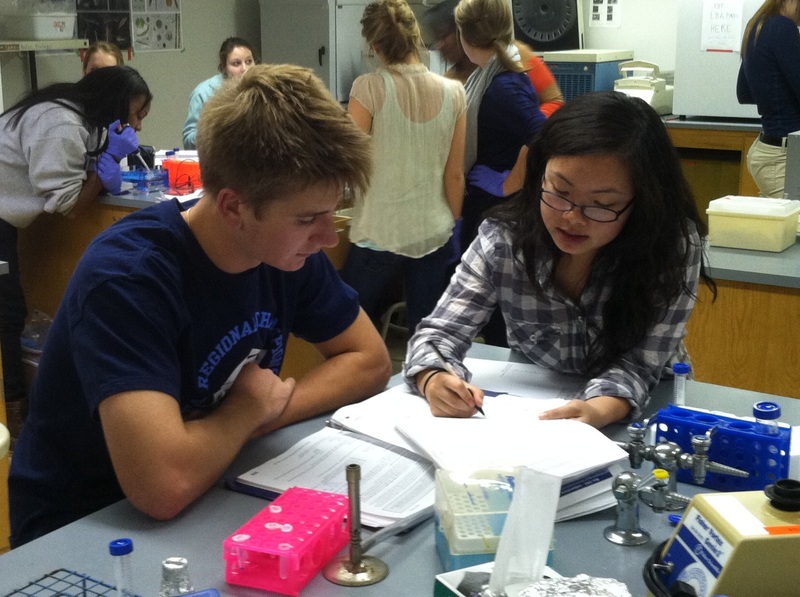 Our goal focuses on providing capable Biology majors with their initial training and experience in teaching science. While we do not have a formal academic program for such training, we endeavor to demonstrate our approach to laboratory teaching by example, through ongoing discussions while on the job, and in weekly meetings. The focus on inquiry-based learning in our laboratory curriculum dictates a need for TA’s to have a more active teaching role in lab and a high degree of technical competency with computing and basic lab techniques to help meet our instructional goals of teaching process as well as concept. We hope the TA experience will improve your knowledge of Biology and impart basic laboratory teaching skills which will benefit you as a Teaching Assistant in Graduate School and beyond in your professional career. Positions are available in all core courses, several 100-level lab courses, and occasionally in upper level elective courses. TA’s in Short Term qualify for housing and board. Senior Giang Nguyen ’12, an international student from Viet Nam, worked as a TA for Bio 242. Being a TA can be a rewarding experience. A TA re-learns the material covered in the course in order to be able to explain and teach it. TA’s come to know individual faculty in a cooperative working relationship; at the same time, faculty and staff come to know a TA’s individual skills and may thus be able to write more meaningful letters of recommendation. Finally, TA’s receive an hourly wage based on a scale set by the College through the Student Employment Office (SEO) and Human Resources. 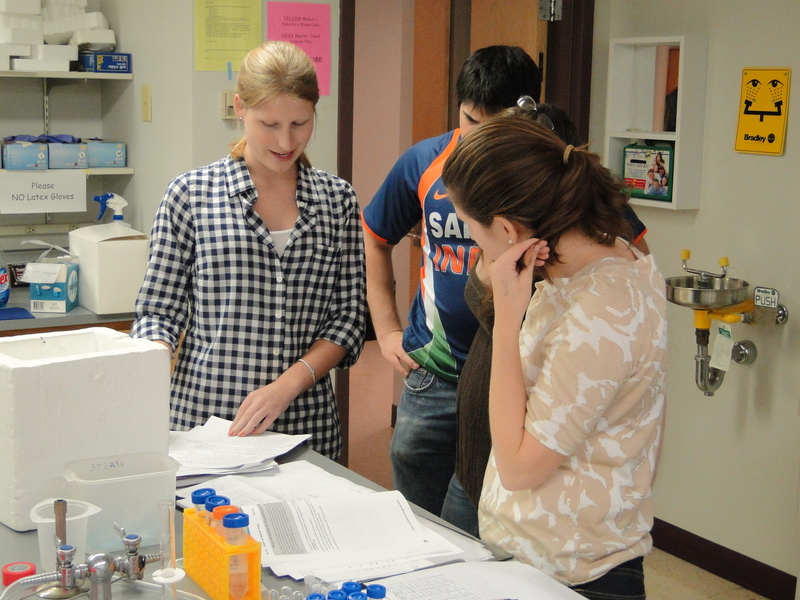 TWA Missy Ducommun ’11 goes over comments on a draft Introduction with a group in lab. The responsibilities of Teaching Assistants vary between courses. In general, TA’s help with some preparation of the lab or field materials (possibly on a weekend), become proficient with and help teach specific skills in the lab (computing, Prism, bench techniques), answer questions, help find materials during lab, work at scheduled evening Help Sessions, do some grading of lab or lecture work, become certified van drivers, and provide invaluable moral support and motivation for the students in their section. The latter point cannot be stressed enough. An atmosphere of enthusiasm for biology and the work at hand can motivate students and improve the general quality of the lab experience. In addition, TA’s must attend weekly meetings where we go over the past lab and discuss the next. Past TA’s have given us valuable critiques of lab activities that have resulted in improvements to the lab. We hope you can provide the similar feedback as you gain experience. TA’s and TWA’s are hired directly through the Department of Biology and need not go to the SEO to apply. Biology majors who demonstrate academic strength within the major are eligible for TA positions. Students need not have received an ‘A’ in a course to become a TA; the willingness to work hard and help your peers is important. In general, we expect that a TA/TWA has taken the course in which they will work. Teaching Assistants: Interested students should obtain and complete an application at least one semester before they wish to get a position. Hard copy applications are also available from Greg Anderson (530 Carnegie). The application will be held in file and will be considered as positions come open. For an upper level elective, contact the appropriate faculty member. While we try to give as many majors the opportunity to be a TA, we cannot, unfortunately, guarantee everyone an opportunity to be a TA. Criteria used for selecting TA’s include academic performance, reliability, technical abilities, critical thinking skills, ability to work semi-independently, interpersonal skills, and motivation. Technical Writing Assistants: Louise Brogan, the Scientific Writing Specialist, trains and supervises student Technical Writing Assistants (TWA’s) to help core course students with scientific writing assignments. TWA’s work in the lab as TA’s and, in addition, hold evening ‘office hours’ to help student PI groups with writing. TWA’s are needed for ALL core courses (Bio 190, 242, and 270) as well as some elective courses. Sophomores and juniors with demonstrably strong writing and critiquing skills are encouraged to apply. If you are interested, complete an application and send a sample of your scientific writing to Louise Brogan at the Writing at Bates Program, 224 Coram Library. Bates Van Driver Certification – Strongly Recommended! TA/TWAs who may work in courses that take field trips (e.g., Bio 270, Short Term field courses, selected electives) are encouraged to become van certified through the Bates Driver Program. The classes are offered multiple time during the fall term. Having TAs who van certified increases our flexibility with trip logistics. You can also pick up extra time by helping with van pick up and drop off throughout the year. When are hiring decisions made? Positions for Bio 190 and Bio 270 are hired late in the fall semester, while Bio 242 positions are filled during the spring and over the summer. Hiring for Short Term courses will take place in mid-winter semester. Positions for 242 are usually reserved for juniors and seniors who have had a broader course experience. Please inquire about the decisions if you have not been notified by these times. What happens after I’m hired? When you are hired as a TA, you must go to Student Employment Office at the Personnel Office on College Street and fill out the necessary payroll paperwork. Your supervisor will go on-line and complete the “gray card” information and receive a Bates Work Card. If not completed already for another position, you will need to complete a Title IX training session of by the Title IX office on campus at the beginning of each semester.. Your hourly wage depends on your position, and you will be paid for every hour you devote to course related activities in your capacity as a TA including lab time, staff meetings, prep work, help sessions, grading, and significant extracurricular tutoring. You will keep track of your own hours each week on an on-line time sheet. When the pay period ends, complete your time sheet and certify it (on-line). Your supervisor will then be notified by automatic notice to confirm your hours on-line the following Monday. Student workers are paid every two weeks. A schedule of pay periods and pay dates is posted on the SEO website.